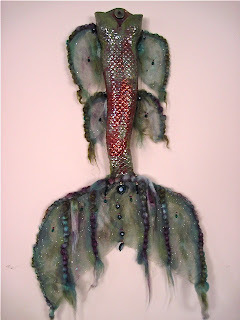 My favorite piece: Mermaid evening gown. 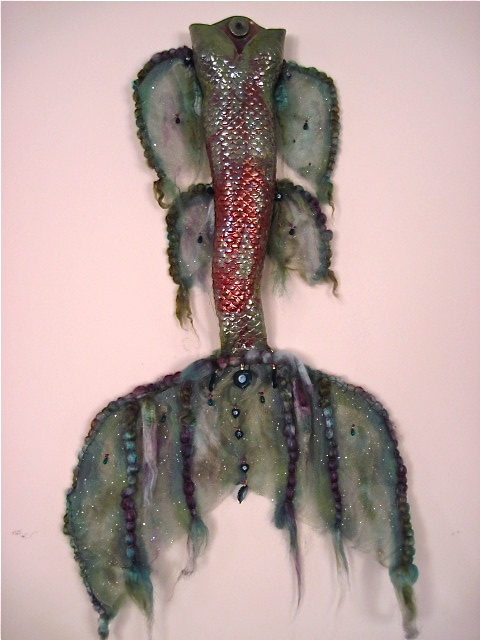 Well, tomorrow I take my 42 pieces to The Hiddenite Center for my largest ever exhibition of one of a kind pieces. Hopefully the next one won't be quite as stressful. It wasn't the one woman show I had asked for, but Helen Keever will be showing water color pieces that won't detract from my mostly pedestal pieces. It is so much more work than I imagined, not only creating the 15 or so new, one of a kind, never made them before pieces, but cataloging and documenting everything. Part of my exhibit is education of how the pieces came to be and who inspired their creation. The show will run from maybe Oct 7- 30. The reception will be on the 30th... why at the end? Out of my hands in scheduling that. His first demonstration: a two piece slab pitcher with a hollow handle. Several months ago Carolina ClayMatters Guild hosted a workshop with Sam Chung, instructor at Arizona State. He specializes in slab constructed pieces, most of which have a serious set of pattern pieces. He started with a simple pitcher design shown below and then went on to create more and more complex pieces like the teapot left. This thing is an ewer- a pouring vessel with no handle. After several months, I finally have a finished and photographed my version of Sam's teapot. It was much harder than it looked to do, and of course I chose the most complicated piece he did to replicate. Hadn't really planned to have it look so much the shape of his teapot, but that was what worked. I made things even more complicated by putting texture on the side panels.